Background and Purpose: A minilaparotomy approach to curative resection of colon cancer has been reported to be an alternative to laparoscopic surgery in terms of minimal invasiveness, although there is little is documentation of the oncological effect of this type of surgery. 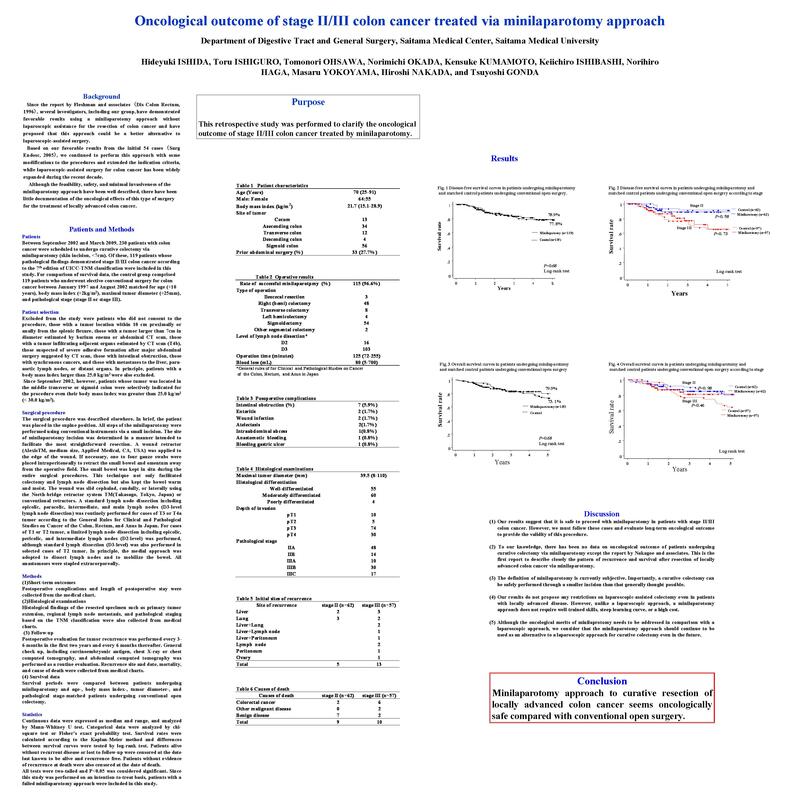 This retrospective study was performed to clarify the oncological outcome of stage II/III colon cancer treated by minilaparotomy. Patients and Methods: We retrospectively analyzed data on 119 patients with stage II/III colon cancer treated via minilaparotomy (skin incision < 7cm) between September 2002 and March 2009. Survival periods were compared between patients undergoing minilaparotomy and those undergoing conventional open colectomy between January 1998 and August 2009, who were matched by age (+5 years), gender, body mass index (+2kg/m2), and pathlogical stage. Results: Patient age ranged from 25 to 91years (median, 70 years). The male:female ratio was 64:55. The sites of primary tumor included the cecum in 13, ascending in 34, transverse in 13, descending in 4, and sigmoid in 55. Pathological stages included stage II in 62 and stage III in 57. Five patients (4.2%) required extension of the minilaparotomy wound up to 10 cm. There was no postoperative mortality. The cumulative 5-year disease-free, disease-specific, and overall survival rates were 91.8%, 94.9%, 76.8% for stage II and 61.6%, 83.8%, 74.0% for stage III. These survival rates were comparable to those for patients undergoing conventional open surgery. Conclusions: These findings suggest that minilaparotomy approach to curative resection of locally advanced colon cancer is oncologically safe compared with conventional open surgery.